LEARN HOW TO create valuable, shareable content to attract and convert prospects into customers. The buzz around content marketing continues to grow, and so do the growing pains. There’s little doubt that as corporate digital initiatives become less of an experiment and more of the norm, they will face increasing executive scrutiny. Agencies and internal teams alike should brace themselves for tougher cross-examinations about program results and ROI. A strong command of multiple marketing fundamentals is required in order to succeed. 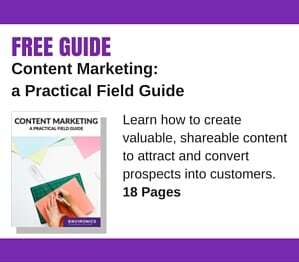 In our executive guide, Content Marketing: A Practical Field Guide, we provide a digestible, step-by-step approach to help. If you’re looking to implement a content marketing plan, or wanting to see higher growth within your firm, this guide is a perfect place to start.